Once upon a time, there was a family that moved to a tiny town called Ijamsville, MD. 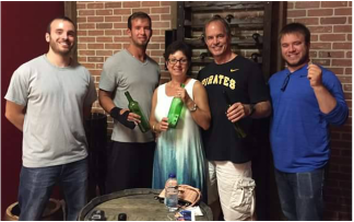 Michael and Cindy Sparks raised their kids in Frederick County, watching as Chris, Shawn, and Zach graduated from Urbana Elementary School, Windsor Knolls Middle School (and later, Urbana Middle), and Urbana High School. Active in our community, we Sparks are happy to call Frederick home and excited to be opening the Family Business in our hometown! Surelocked In Escape Games (a Game Overlords, L.L.C. 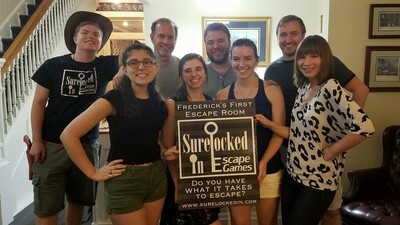 production) was born on a family vacation in the summer of 2015 when, while looking for something to do on a slow day away, the Sparks family stumbled upon an Escape Room! Our family of 5 had a blast scrambling to solve the puzzles and beat the clock. Even though we failed to unlock that door, the idea of building an Escape Room became forever locked in our minds. We traveled far and wide locking ourselves into rooms. Win or lose, nothing beats having a great time with those you love! 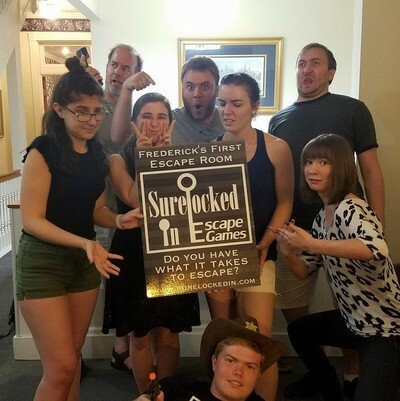 As the weeks turned to months, we began to realize that the best Escape Rooms all had 3 things in common: their puzzles were fun, their activities brought people together, and their addresses were set in historic, vibrant communities. We began searching for a place to set up shop in Maryland's best city, and we are thrilled and honored to be able to bring something that has brought our family so much joy home to Frederick! We look forward to bringing a new, wholesome, family-friendly entertainment experience to Downtown that is unlike any other. Come on over and experience our Adventures, because it's all fun and games when it's all fun and games! We look forward to puzzling you soon!